The banking and financial landscape in the past 5 years have been inundated with ‘techs’. FinTech, InsurTech and RegTech are just some of the new buzzwords. However, in an environment of thinning margins, low global growth and increasing cost of compliance and doing business, no Islamic financial institution can afford to ignore the march of technology particularly. Cheaper, simpler and more efficient financial solutions which do not necessarily require banks or any forms of intermediation are becoming commonplace. 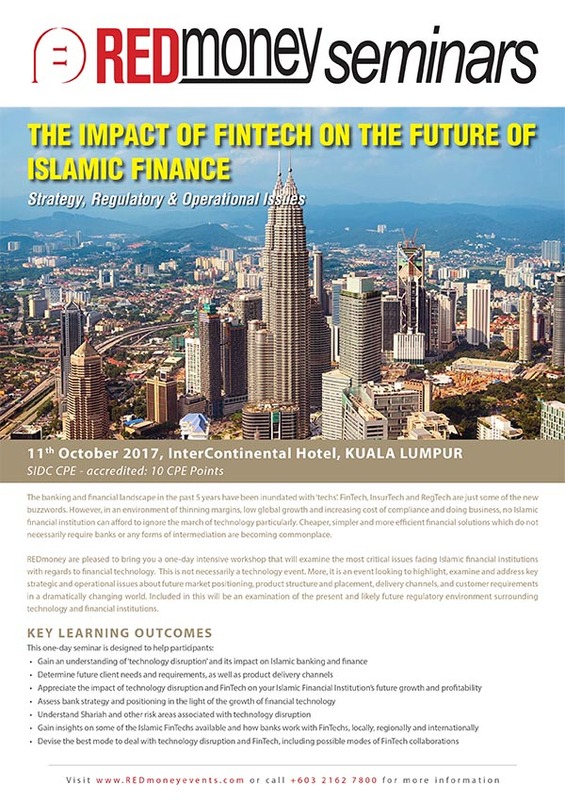 REDmoney are pleased to bring you a one-day intensive workshop that will examine the most critical issues facing Islamic financial institutions with regards to financial technology. This is not necessarily a technology event. More, it is an event looking to highlight, examine and address key strategic and operational issues about future market positioning, product structure and placement, delivery channels, and customer requirements in a dramatically changing world. Included in this will be an examination of the present and likely future regulatory environment surrounding technology and financial institutions.